I have been asked by more than a couple of readers to re-post this article from last year on this day when we honor our fallen heroes. The inspiration for the article was the apology tour that Barry continues with his bowing and scraping to just about everybody but Americans. I have another article that I have been working on that will be published today which (in my humble opinion) states the reason why we see so many of these white crosses all over the world. Look for it later today. A reader of this blog, Nancy, left a comment on the previous post but was unable to put what follows into comments. I have added some background, and you will be able to find more pics here. The 42.5-acre Aisne-Marne Cemetery and Memorial in France, its headstones lying in a sweeping curve, sits at the foot of the hill where stands Belleau Wood. The cemetery contains the graves of 2,289 war dead, most of whom fought in the vicinity and in the Marne valley in the summer of 1918. The memorial chapel sits on a hillside, decorated with sculptured and stained-glass details of wartime personnel, equipment and insignia. Inscribed on its interior wall are 1,060 names of the missing. Rosettes mark the names of those since recovered and identified. During World War II, the chapel was damaged slightly by an enemy shell. 3. 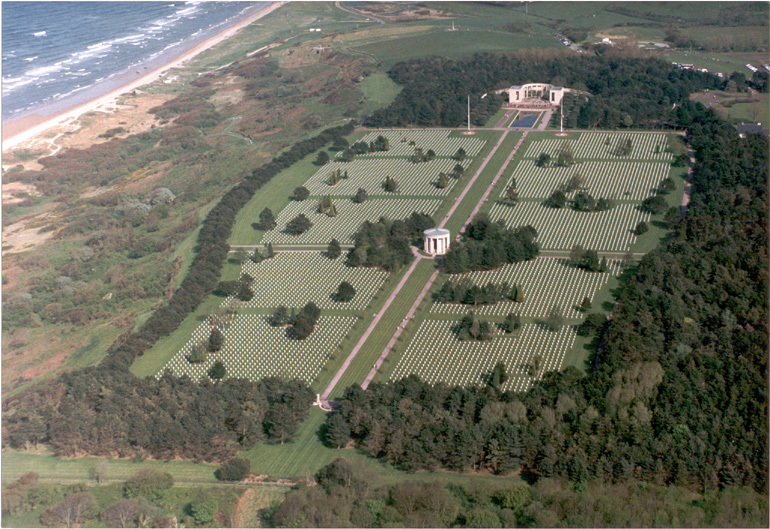 The American Cemetery at Brittany, France . The Brittany American Cemetery and Memorial in France covers 28 acres of rolling farm country near the eastern edge of Brittany and contains the remains of 4,410 of our war dead, most of whom lost their lives in the Normandy and Brittany campaigns of 1944. Along the retaining wall of the memorial terrace are inscribed the names of 498 of the missing. Rosettes mark the names of those since recovered and identified. The gray granite memorial, containing the chapel as well as two large operations maps with narratives and flags of our military services, overlooks the burial area. Stained glass and sculpture embellish the structure. The lookout platform of the tower, reached by 98 steps, affords a view of the stately pattern of the headstones, as well as of the peaceful surrounding countryside stretching northward to the sea and Mont St. Michel. 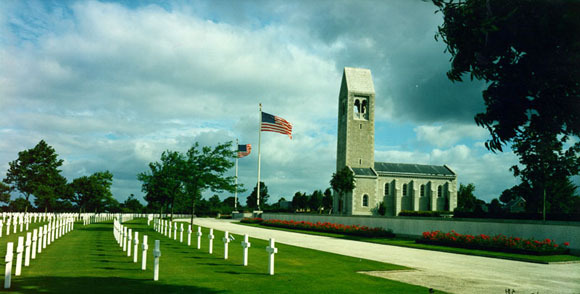 The cemetery is located on the site of the temporary American St. James Cemetery, established on August 4, 1944 by the U.S. Third Army. It marks the point where the American forces made their breakthrough from the hedgerow country of Normandy into the plains of Brittany during the offensive around Avranches. 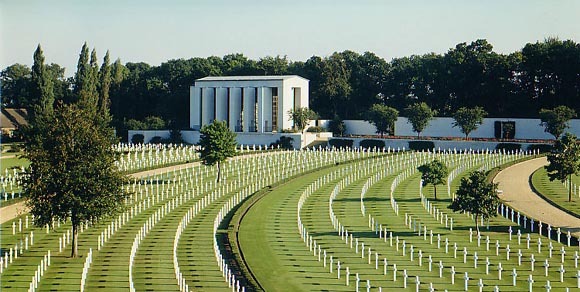 The 4.5 acre Brookwood American Cemetery and Memorial in England lies to the west of the large civilian cemetery built by the London Necropolis Co. and contains the graves of 468 of our military dead. Close by are military cemeteries and monuments of the British Commonwealth and other allied nations. Automobiles may drive through the Commonwealth or civilian cemeteries to the American cemetery. Within the American cemetery the headstones are arranged in four plots, grouped about the flagpole. The regular rows of white marble headstones on the smooth lawn are framed by masses of shrubs and evergreen trees which form a perfect setting for the chapel, a classic white stone building on the north end of the cemetery. The interior of the chapel is of tan-hued stone. Small stained-glass windows light the altar and flags and the carved cross above them. On the walls within the chapel are inscribed the names of 563 of the missing. Rosettes mark the names of those since recovered and identified. The Cambridge American Cemetery and Memorial site in England, 30.5 acres in total, was donated by the University of Cambridge. It lies on a slope with the west and south sides framed by woodland. The cemetery contains the remains of 3,812 of our military dead; 5,127 names are recorded on the Tablets of the Missing. Rosettes mark the names of those since recovered and identified. Most died in the Battle of the Atlantic or in the strategic air bombardment of northwest Europe. 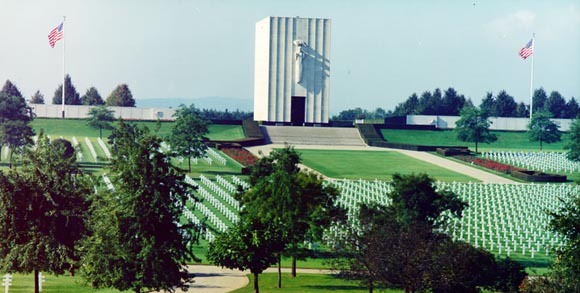 The Epinal American Cemetery and Memorial in France, 48.6 acres in extent, is sited on a plateau 100 feet above the Moselle River in the foothills of the Vosges Mountains. It contains the graves of 5,255 of our military dead, most of whom lost their lives in the campaigns across northeastern France to the Rhine and beyond into Germany. The cemetery was established in October 1944 by the 46th Quartermaster Graves Registration Company of the U.S. Seventh Army as it drove northward from southern France through the Rhone Valley into Germany. 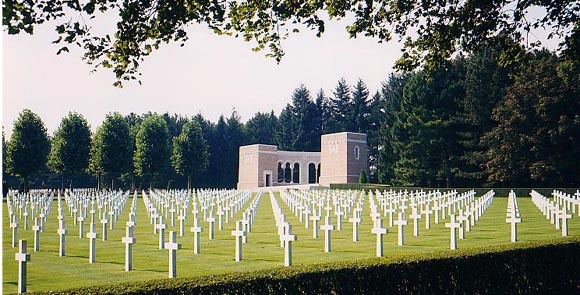 The cemetery became the repository for the fatalities in the bitter fighting through the Heasbourg Gap during the winter of 1944-45. The memorial, a rectangular structure with two large bas-relief panels, consists of a chapel, portico, and map room with a mosaic operations map. On the walls of the Court of Honor, which surround the memorial, are inscribed the names of 424 of the missing. Rosettes mark the names of those since recovered and identified. Stretching northward is a wide, tree-lined mall that separates the two large burial plots. At the northern end of the mall, the circular flagpole plaza forms an overlook affording a view of a wide sweep of the Moselle Valley. On May 12, 1958, thirteen caskets draped with American flags were placed side by side at the memorial. 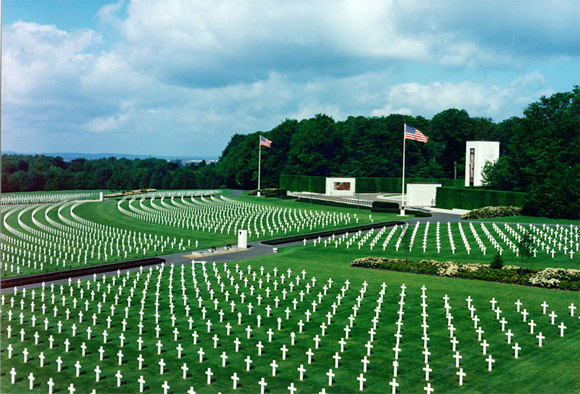 Each casket contained the remains of one World War II Unknown American, one from each of the thirteen permanent American military cemeteries in the European Theater of Operations. 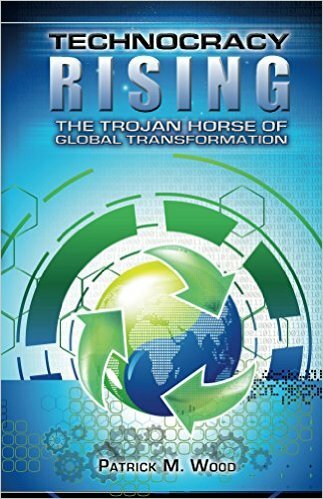 In a solemn ceremony, General Edward J. O’Neill, Commanding General of the U.S. Army Communication Zone, Europe, selected the Unknown to represent the European Theater. It was flown to Naples, Italy and placed with Unknowns from the Atlantic and Pacific Theaters of Operation aboard the USS Blandy for transportation to Washington, D.C. for final selection of the Unknown from World War II. On Memorial Day, 1958, the remains were buried alongside the Unknown from World War I at the Tomb of the Unknown Soldier at Arlington National Cemetery. 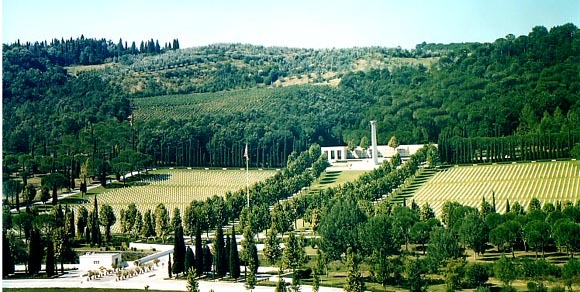 The Florence American Cemetery and Memorial site in Italy covers 70 acres, chiefly on the west side of the Greve “torrente.” The wooded hills that frame its west limit rise several hundred feet. Between the two entrance buildings, a bridge leads to the burial area where the headstones of 4,402 of our military dead are arrayed in symmetrical curved rows upon the hillside. They represent 39 percent of the U.S. Fifth Army burials originally made between Rome and the Alps. Most died in the fighting that occurred after the capture of Rome in June 1944. Included among them are casualties of the heavy fighting in the Apennines shortly before the war’s end. On May 2, 1945, the enemy troops in northern Italy surrendered. At the Henri-Chapelle American Cemetery and Memorial in Belgium, covering 57 acres, rest 7,992 of our military dead, most of whom lost their lives during the advance of the U.S. armed forces into Germany. Their headstones are arranged in gentle arcs sweeping across a broad green lawn that slopes gently downhill. A highway passes through the reservation. West of the highway an overlook affords an excellent view of the rolling Belgian countryside, once a battlefield. To the east is the long colonnade that, with the chapel and map room, forms the memorial overlooking the burial area. The chapel is simple but richly ornamented. In the map room are two maps of military operations, carved in black granite, with inscriptions recalling the achievements of our forces. On the rectangular piers of the colonnade are inscribed the names of 450 missing. Rosettes mark the names of those since recovered and identified. The seals of the states and territories are also carved on these piers. The cemetery possesses great military historic significance as it holds fallen Americans of two major efforts, one covering the U.S. First Army’s drive in September 1944 through northern France, Belgium, Holland and Luxembourg into Germany, the second covering the Battle of the Bulge. It was from the temporary cemetery at Henri-Chapelle that the first shipments of remains of American war dead were returned to the U.S. for permanent burial. The repatriation program began on July 27, 1947 at a special ceremony at the cemetery when the disinterment began. The first shipment of 5,600 American war dead from Henri-Chapelle left Antwerp, Belgium the first week of October 1947. An impressive ceremony was held, with over 30,000 Belgium citizens attending along with representatives of the Belgium government and senior Americans. The Lorraine American Cemetery and Memorial in France covers 113.5 acres and contains the largest number of graves of our military dead of World War II in Europe, a total of 10,489. Their headstones are arranged in nine plots in a generally elliptical design extending over the beautiful rolling terrain of eastern Lorraine and culminating in a prominent overlook feature. Most of the dead here were killed while driving the German forces from the fortress city of Metz toward the Siegfried Line and the Rhine River. Initially, there were over 16,000 Americans interred in the St. Avold region, mostly from the U.S. Seventh Army’s Infantry and Armored Divisions and its Cavalry Groups. St. Avold served as a vital communications center for the vast network of enemy defenses guarding the western border of the Third Reich. 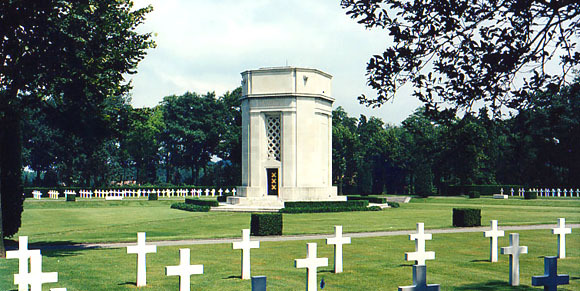 The Luxembourg American Cemetery and Memorial, 50.5 acres in extent, is situated in a beautiful wooded area. The cemetery was established on December 29, 1944 by the 609th Quartermaster Company of the U.S. Third Army while Allied Forces were stemming the enemy’s desperate Ardennes Offensive, one of the critical battles of World War II. The city of Luxembourg served as headquarters for General George S. Patton’s U.S. Third Army. General Patton is buried here. Not far from the cemetery entrance stands the white stone chapel, set on a wide circular platform surrounded by woods. It is embellished with sculpture in bronze and stone, a stained-glass window with American unit insignia, and a mosaic ceiling. Flanking the chapel at a lower level are two large stone pylons upon which are maps made of various inlaid granites, with inscriptions recalling the achievements of the American armed forces in this region. On the same pylons are inscribed the names of 371 of the missing. Rosettes mark the names of those since recovered and identified. Sloping gently downhill from the memorial is the burial area containing 5,076 of our military dead, many of whom lost their lives in the “Battle of the Bulge” and in the advance to the Rhine. Their headstones follow graceful curves; trees, fountains and flower beds contribute to the dignity of the ensemble. The World War II Netherlands American Cemetery and Memorial is the only American military cemetery in the Netherlands. The cemetery site has a rich historical background, lying near the famous Cologne-Boulogne highway built by the Romans and used by Caesar during his campaign in that area. The highway was also used by Charlemagne, Charles V, Napoleon, and Kaiser Wilhelm II. In May 1940, Hitler’s legions advanced over the route of the old Roman highway, overwhelming the Low Countries. In September 1944, German troops once more used the highway for their withdrawal from the countries occupied for four years. The cemetery’s tall memorial tower can be seen before reaching the site, which covers 65.5 acres. From the cemetery entrance the visitor is led to the Court of Honor with its pool reflecting the tower. At the base of the tower facing the reflecting pool is a statue representing a mother grieving her lost son. To the right and left, respectively, are the Visitor Building and the map room containing three large, engraved operations maps with texts depicting the military operations of the American armed forces. Stretching along the sides of the court are Tablets of the Missing on which are recorded 1,722 names. Rosettes mark the names of those since recovered and identified. Within the tower is a chapel. The light fixture in the chapel and the altar candelabra and flower bowl were presented by the government of the Netherlands and by the local Provincial administration. Beyond the tower is a burial area divided into 16 plots, where rest 8,301 of our military dead, their headstones set in long curves. A wide, tree-lined mall leads to the flagstaff that crowns the crest. 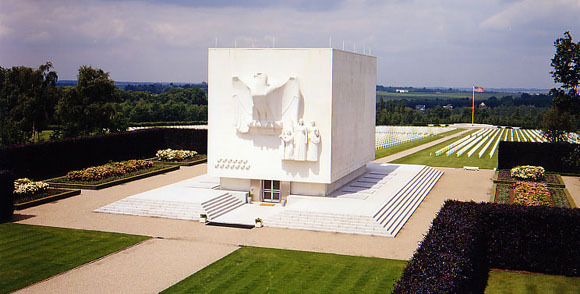 The Normandy American Cemetery and Memorial in France is located on the site of the temporary American St. Laurent Cemetery, established by the U.S. First Army on June 8, 1944 and the first American cemetery on European soil in World War II. The cemetery site, at the north end of its ½ mile access road, covers 172.5 acres and contains the graves of 9,387 of our military dead, most of whom lost their lives in the D-Day landings and ensuing operations. On the Walls of the Missing in a semicircular garden on the east side of the memorial are inscribed 1,557 names. Rosettes mark the names of those since recovered and identified. The Oise-Aisne American Cemetery and Memorial in France contains the remains of 6,012 American war dead, most of whom lost their lives while fighting in this vicinity in 1918 during the First World War. Their headstones, aligned in long rows on the 36.5-acre site, rise in a gentle slope from the entrance to the memorial at the far end. The burial area is divided into four plots by wide paths lined by trees and beds of roses; at the intersection are a circular plaza and the flagpole. 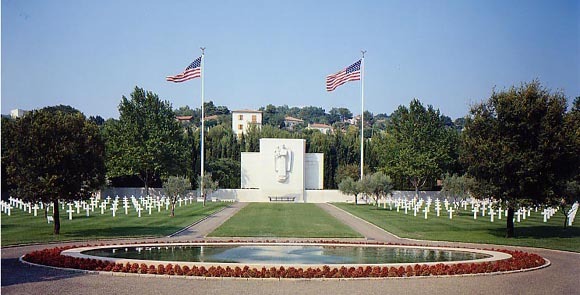 The site of the Rhone American Cemetery and Memorial in France was selected because of its historic location along the route of the U.S. Seventh Army’s drive up the Rhone Valley. It was established on August 19, 1944 after the Seventh Army’s surprise landing in southern France. On 12.5 acres at the foot of a hill clad with the characteristic cypresses, olive trees, and oleanders of southern France rest 861 of our military dead, most of whom lost their lives in the liberation of southern France in August 1944. Their headstones are arranged in straight lines, divided into four plots, and grouped about an oval pool. At each end of the cemetery is a small garden. On the hillside overlooking the cemetery is the chapel with its wealth of decorative mosaic and large sculptured figures. Between the chapel and the burial area, a bronze relief map recalls military operations in the region. On the retaining wall of the terrace, 294 names of the missing are inscribed. Rosettes mark the names of those since recovered and identified. 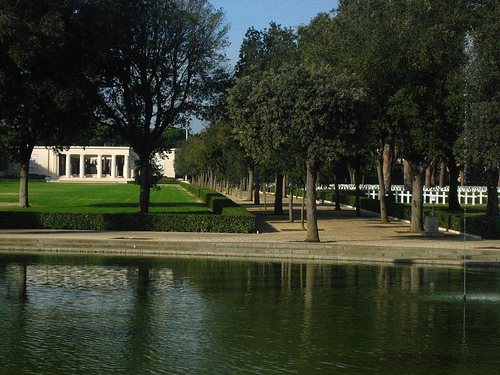 The World War II Sicily-Rome American Cemetery and Memorial site in Italy covers 77 acres, rising in a gentle slope from a broad pool with an island and cenotaph flanked by groups of Italian cypress trees. Beyond the pool is the immense field of headstones of 7,861 of American military war dead, arranged in gentle arcs on broad green lawns beneath rows of Roman pines. The majority of these men died in the liberation of Sicily (July 10 to August 17, 1943); in the landings in the Salerno Area (September 9, 1943) and the heavy fighting northward; in the landings at Anzio Beach and expansion of the beachhead (January 22, 1944 to May 1944); and in air and naval support in the regions. The World War I Somme American Cemetery and Memorial in France is sited on a gentle slope typical of the open, rolling Picardy countryside. The 14.3-acre cemetery contains the graves of 1,844 of our military dead. Most lost their lives while serving in American units attached to British armies, or in operations near Cantigny. 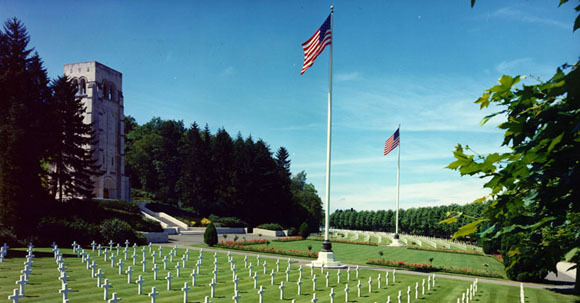 The headstones, set in regular rows, are separated into four plots by paths that intersect at the flagpole near the top of the slope. The longer axis leads to the chapel at the eastern end of the cemetery. The World War I St. Mihiel American Cemetery and Memorial in France, 40.5 acres in extent, contains the graves of 4,153 of our military dead. The majority of these died in the offensive that resulted in the reduction of the St. Mihiel salient that threatened Paris. The burial area is divided by Linden alignment trees and paths into four equal plots. At the center is a large sundial surmounted by an American eagle. To the right (west) is a statue of a World War I soldier and at the eastern end is a semi-circular overlook dominated by a sculpture representing a victory vase. Originally a World War I cemetery, the Suresnes American Cemetery and Memorial just outside Paris, France now shelters the remains of U.S. dead of both wars. The 7.5-acre cemetery contains the remains of 1,541 Americans who died in World War I and 24 Unknown dead of World War II. Bronze tablets on the walls of the chapel record the names of 974 World War I missing. Rosettes mark the names of those since recovered and identified. Remind Americans of our sacrifices and don’t confuse arrogance with leadership. What you have just seen is just one aspect that makes us what we are, and why this republic that became the melting pot of the world is such an enigma to so many. I am still waiting for an Islamic nation to step up and stop wars and genocide instead of creating them. DT, I remember this from last year, a very moving tribute to those who have made the ultimate sacrifice. There is no reason for Americans to apologize when we have given our own to help others, who either could not or would not help themselves. God Bless our fallen hero’s and all of those who have or are now serving. I pray for those who serve as they are in the gravest of danger not only from those who they are fighting but more so from those who are in DC. This has been around for awhile but today seems fitting to view it once again. Yes … how arrogant of us to have given so much. Perhaps we could have kept them all home, safe … so the world could hate us more. Well, that is exactly what I think. Bring them all home and let God sort out what comes next. Thanks, DT, it is awe-inspiring, as it was last year. Here are taps that I found on Twana Blevins’s blog last year. You never heard anything like this little girl! I pondered what to post here..My father served in the Pacific WWII, my family came to America’s Shores in 1647 and again in 1701 from the UK, we have a long Military History..My Dad use to get choked up and misty eyed at a ball game when I was a kid when The National Anthem was played..I grew up with stories of my Dad being wounded,A Great Uncle in the War of 1898, an Uncle gassed in the trenches in WWI, and those lost during the Civil War. And now a young cousin lost in Afghanistan a year ago..I have visited the Arizona Memorial and you can’t not be moved by the names there. I’ve been to the Punchbowl and to Arlington..The Citizens of the U.S.A. must wake up as to what has been placed in the White House, and who put it there.. I lost many friends in Viet Nam and a couple more in the first Gulf War, and I say to them AND ALL those who paid the ultimate sacrifice, REST IN PEACE! Probably the only guys in America right now obama’s not accusing of being radical racist domestic terrorist’s! hey o-blah blah Iv’e a feeling those guys are gonna be waiting for you when you get there! trying to visualize o-barf storming the beach on D-day …………………………….nope cant see it!